Nights are getting chilly, and a few days ago, in the evenings, we started lighting the wood stove at Kendall’s house in town. It takes some skills. Paying attention to the mechanics of heating was never part of the mix in my few years of winter farm living. It was either central heating by oil furnace, or with electric space heaters, and both ways, really no different from city life convenience: adjust a thermostat or click a switch, pay the bill, and that was that. Pretty mindless. Great Post! Biomass is the way to go. The other thing you didn’t mention is the time and effort required to gather the fuel. That’ll bring it even closer to home and is actually a great experience . Many houses could probably cut their required BTUs by a significant amount by upgrading the building envelope and installing an HRV. 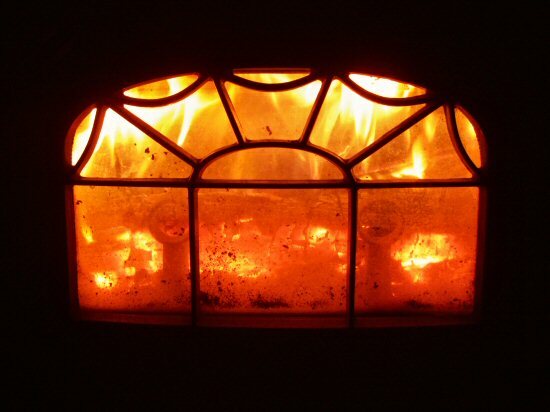 I love the heat that comes from a wood stove, much moreso than from electric or gas. Chris: Yes, it’s a Vermont Castings Resolute Acclaim 0041, circa 1990. Kendall picked it up for practically nothing from someone who just wanted to get it out of their house. Go figure! Found the owner’s manual online and printed it out, which is a bonus (I like manuals!). I love the evening fires and watch the snow outside. I even like to make a snowman in early evening. I chuckled as I read this post. It parallels our current experience! We’re in NS where it was -18 when I ventured out to stoke the stove, rigged up to the back of a decommed oil blower in the basement. Our wellpump pipes have been frozen for most of the month, all bar the last four days when a friend came over with a steam injector and cleared the ice block. Love your blog and I’m glad you’re posting again! This hits close to home. We just settled on a cook stove right before Christmas and are now in the “getting to know you” stage. It’s not easy to see my white ceilings slowly turning dusty and now blackish in spots…perhaps I’ll just paint them black. Besides the initial smoke troubles, we sure do love it. I have been heating with a woodstove for over twenty years, and have at times also had a wood cookstove. Wood heat is the best! We heat the bulk of our water in a large 3-4 gallon pot on top of the stove, that we dip into when we need to wash dishes, etc. And nothing is better than curling up to the fire when it is snowing (or more likely here, raining) outside. first visit and I just wanted to stop by to say Hi Everyone. And those wood ashes will be a bonus for the garden, yes? Nice Post. I could feel it!! Good to see you posting again. We have linked your blog under favourites link. Excited to follow year 2011 of tiny farming. Wood burning is a lot of work but you get heat to the bone, not like electric, oil, gas. It is a good feeling have your 5.5 cords stored, cut, split, ready to get you through a Maine winter. The sound of a crackling fire, the glow all just make you feel good, beyond the heat. My Dad used to sell Jotuls and they are very efficient because where they come from, Europe, not as much wood, and they treat their woodlots carefully. Giving them to their kids in better shape than they got it respect. Those old Vermont Casting stoves are magnificent for heating. Not the most earth friendly as far as what goes up and out the chimney, but the design for efficient heating is impeccable. We heat with a “scrounged” “Country” Brand stove of late 80’s vintage and it is so easy to damper down at night to ensure nice red coals when I get up in the morning to start the new day’s fire with. Hint: We have collected 5-6 trash bags packed with dryer lint from the local laundry mat – it makes great fire started when rolled into tight balls. I like your blog and have in fact linked to it from my own. Cheers and I hope your Spring comes early and with great bounty! wow! nice! we need one at home especially during winter! A very good source of heat. I like it! I would like to buy your acclaim model 0041 or swap it for a new stove, no joke need it for research. The heat from a woodburner is a much nicer heat than a central heating gas system can produce. You really can’t beat the natural warming glow of a wood burning stove. It’s very important however to ensure the stoves are maintained regularly to ensure they give you a long and efficient life.